A violinist’s inspired and impromptu choice of music at the Greek-Macedonian border tells us a lot about the Syrian refugee crisis. Dusk was slowly settling over the savannah-like border between Macedonia and Greece. Flocks of doves were gliding over fields of parched and wilted sunflowers. In the distance, a local hunter was slowly negotiating the thicket-strewn terrain, accompanied by his three dogs. Under the trees and leaning against the deserted border posts still demarcating the obsolete Yugoslav state, visibly tired groups of Syrian and Afghan refugees were waiting for a sign. What they were really waiting for was official permission to continue on the next phase of their doleful odyssey to the heart of Europe. This year, some 200,000 migrants and refugees had already reached their destination through Turkey, Greece, Macedonia, Serbia and Hungary – at the moment of our reporting, at least as many were on their way. 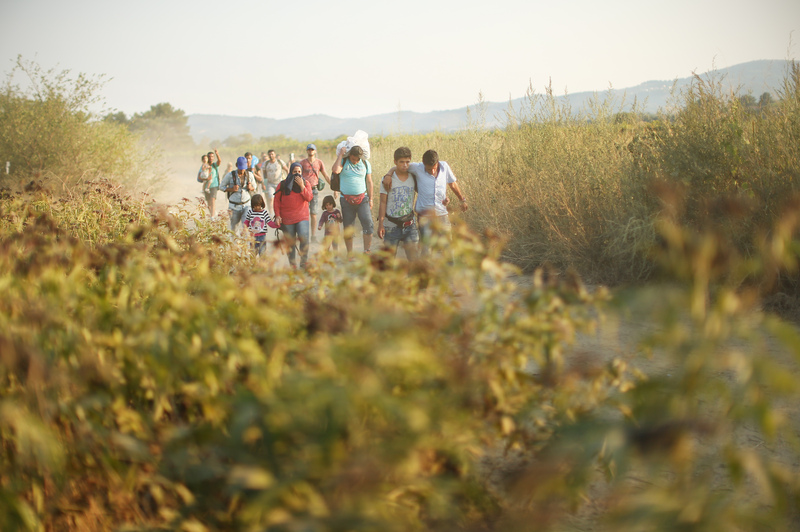 On the Greek side of the border, group after group of new arrivals were trudging their way towards the improvised collecting centre by the railway tracks. In a carefully coordinated effort, the Greek and Macedonian police were letting them through the bottleneck at the “wild border”, which, in the last week alone, has been crossed by more than 3,000 people. At the collecting centre, which had been set up by the Macedonian authorities two weeks ago, Rami Basisah opened his knapsack and took out a violin. The 24-year-old musician went on to give it a few tender, almost enamoured strokes, after which he began to tune it. 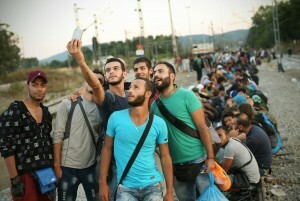 The seemingly shy and introverted youth – still more of a boy than a man, really – stepped in front of some 600 migrants and refugees waiting for the special train to the Serbian border, the next stage of their journey to what at least some of them still believed to be the promised land. Rami, who had studied music in the Syrian town of Homs, needed a few moments to pluck up his courage to pluck away at his violin. His friends were encouraging him to take a deep breath and simply start playing. The Macedonian policemen – some of whom had been on duty for the past 30 hours – could only gape in a mixture of worry and confusion. A few of them exchanged silent glances, clearly wondering if they should confiscate the instrument. Theirs was an extremely stressful and demanding job, and most of them had not received proper training for it. Then one of them simply nodded to Rami to indicate it was okay for him to begin. Rami shifted his stance a few times, taking in the atmosphere. It was becoming clear that he simply had to play. He started slow. The tune felt so gentle it was almost tremulous. The conversations among the refugees came to a halt; the children’s gibes instantly turned to primal awe. Even the policemen began to smile. They were obviously familiar with the melody, at least some of them must have heard it before. 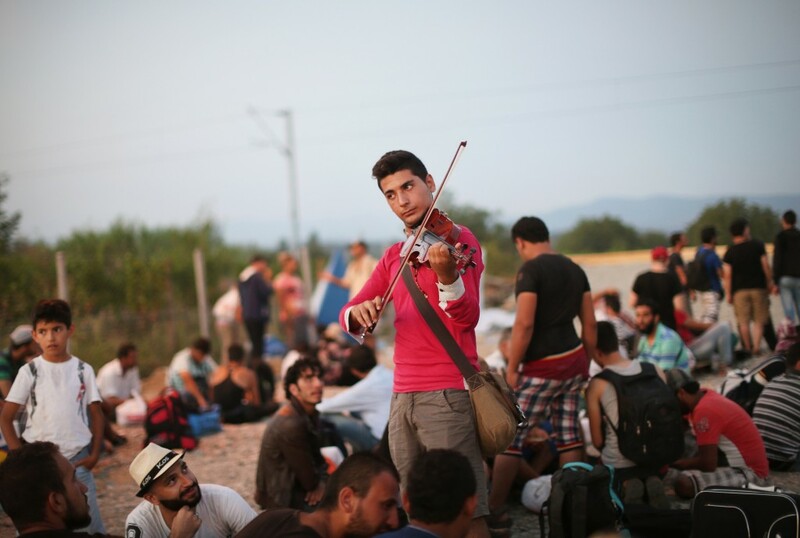 The warm response enabled the young Syrian musician to relax and start giving it his all. Even the most dispassionate ears were beginning to respond to the tune. Rami was getting more and more in the zone. His oppressive thoughts were dispersed, and he was so clearly guided by pure love. He started to smile. His entire face became animated with tender irony. The air at the collection centre was resonating with Beethoven’s Ode to Joy. Irony? A good joke? A stroke of brilliant political analysis? Spur-of-the-moment psychotherapy? The police were now tapping their boots in time with the rhythm. The migrants were clapping enthusiastically to cheer the lad on. After he was done with the Beethoven, Rami halted for a few seconds. Then hlade chose a profoundly rueful, yet ferociously proud traditional Syrian patriotic song. His friends – all of whom hailed from devastated Homs, all of whom were educated and urban young men and women – began to sing. Soon, more and more of the refugees joined in. Rugged old men who had seen and endured unspeakable things were starting to cry. The women hugged their children a little tighter. The icy pain in their chests was temporarily melted down by a fresh flame of hope. Rami played on and on, oblivious to the his growing audience of refugees. Dusk was settling over the horizon. The stunning performance was concluded with Vivaldi’s Four Seasons, an obvious yet still inspired choice. To the almost overwhelming sound of applause, Rami took a bashful bow and put away his instrument. “I apologise, I made so many mistakes. I was so nervous,” the young musician told me, still breathing hard from the exertion. “You know, this is my reserve violin – it is much much worse than the one that ended up in the sea,” he told me. Rami left Syria some 40 days earlier. Before that, he had spent two years as a refugee in his own homeland. Two weeks ago, he and his friends had opted for the “classic” route from Turkey to the Greek island of Kos. For them, the sea voyage had been the most stressful, dangerous and simply bloodcurdling part of the journey. The suitcase carrying Rami’s very first violin had been flushed into the Aegean Sea. “It still hurts,” he told me in a small voice, making a valiant effort to smile. “This” was the unpunctuated caravan of human tragedy, sent off on its long march to freedom by the aftershocks of history and that most innate thing of all, the survival instinct. It is much the same on the other side of the border, where one of the local hopefuls has actually parked a van neatly refitted into an ice-cream shop. Last Sunday, when as many as 150 buses pulled in to disgorge some 7,000 migrants and refugees, the shop was reported to have done excellent business. 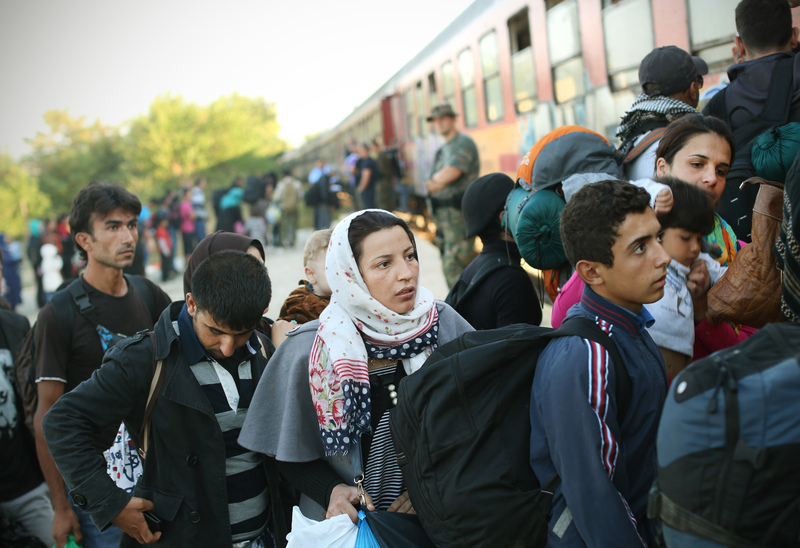 As the air brakes started to squeal, the refugee-packed train gradually came to a halt. To avoid chaos, the police ordered the migrants and the refugees into a number of smaller groups. The tired and grimy travellers kept repeating they were in a hurry, all the while inquiring when the next train for the Serbian border was set to leave. Panic began to settle into the hearts and minds of these exhausted men and women. 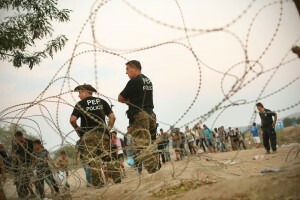 A few more days and it would no longer be possible to cross the Hungarian border. For the countless thousands of desperate souls, this would mean being trapped in Balkan territory. A three-year-old girl woke up from a deep sleep. As soon as she took in the night-time chaos of the highly restless crowd, tears came spilling down her face. The police allowed the handicapped, the wounded, the seriously ill and the mothers with babies to jump to the front of the long line waiting to cross the border. I heard one of the policemen ask a colleague why a certain 75-year-old man – clearly devastated by a number of serious illnesses – would even set out on this journey to cross half the world to reach Germany. Because the Syrian conflict is worse than any of those etched on our notoriously short historical memories. Because in the last four and a half years, it has already killed 260,000 people. Because 11 million people have been forced to leave their homes, 4.5 million of them having fled to neighbouring countries. Because vast swathes of the country have been razed to the ground. Because the present is destroying every possibility of a bearable future while – remember Palmyra! – erasing every inkling of the past. Because the western countries who are now treating these people like nuclear waste have done nothing to end the war, have in fact done much to ensure it goes on and on. Because hope may spring eternal, but there can be no hope when you and your entire family are dead. “We are in a hurry. 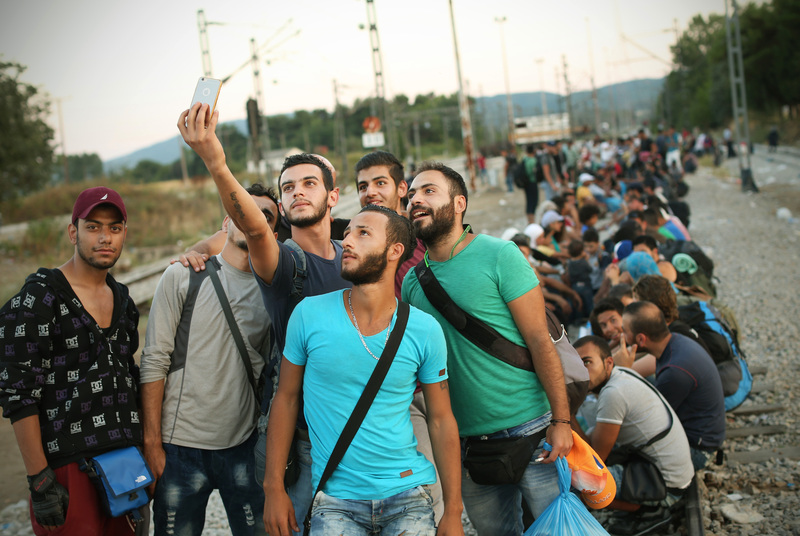 We’re worried that the Hungarian border will be closed down before we can reach it. We desperately need to catch that train! We don’t have the money for a taxi. In Turkey, we were robbed by the traffickers,” a man named Saeed told me as he stood nervously near the end of one of the queue. The 26-year-old English teacher was from the Syrian town of Latakia, the Assad regime’s stronghold located by the Mediterranean Sea. Saeed fled the coastal town because he refused to join the government forces. So far, the regime troops’ heavy presence had spared the city from most of the fighting, but mobilisation was becoming inevitable. Saeed refused to shoot at his own people and take part in the utter destruction of his own homeland. When it was his turn to leave for the front, his two obvious options were to go murder his freedom-fighter compatriots or rot in a jail cell with occasional bouts of the sort of savage torture written into the very DNA of Assad’s regime. Saeed decided to take the third option, which was to escape. “A few months ago, I fled Latakia for the nearby hills controlled by the Free Syrian Army. They, too, wanted me to join them, but I turned them down. My wife had just given birth. Ahmed is now seven months old, and I didn’t want him to grown up without a father. So I taught English for a while in one of the schools in FSA-held territory, then the entire village was destroyed in a governmental air raid,” Saed recollected. “Most of my neighbours and friends were killed in the strike. I was the one who had to pick up what remained of their bodies and try to put the pieces back together. I could quite easily have gone mad. The whole thing was unspeakably horrible. As soon as I could, I got my wife and son and fled to Turkey,” Saeed went on with his grim tale, darting impatient glances toward the train and the police. Saeed was one of the eight Syrian refugees who had actually swum from Greece to Turkey. After being swindled and robbed by the Turkish traffickers, they had no recourse but to try to swim the 12km to the Greek island of Kos. They spent 16 hours in the water. They were very cold, but they had managed to secure some life-jackets which enabled them to get plenty of rest. They stuffed all their belongings into a few waterproof bags they tied to their waists. As they slowly made their way, they were overtaken by a few rubber boats carrying their fellow refugees. Saeed and his swimming companions ultimately reached Kos when the conditions there were at their most chaotic. The police were openly beating up the migrants, who were also beating each other up. 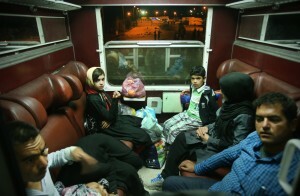 Some 500m from the coast, the freezing and dehydrated Syrian swimmers were picked up by the Greek coast guard. “They insulted us and pushed us around for a bit. When we got to the coast, they started beating us. It was horrible,” he recalled. “We didn’t know what to do or where to go. The other refugees told us we needed to register at the police station, since we were not allowed to continue our journey without the necessary papers. We obtained our permits after five days. We immediately got on a ferry to Athens. We didn’t even make a stop there – we knew very well what was going on at the Hungarian border. 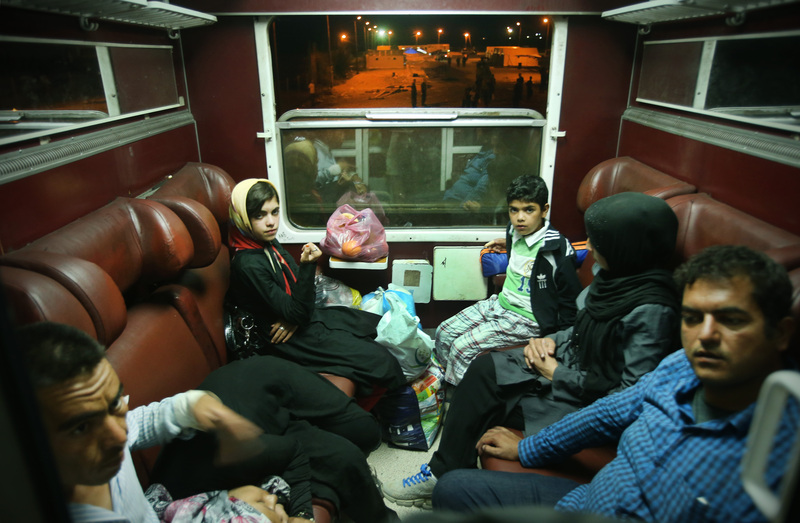 We took a bus for Thessaloniki and onward to the border, where we arrived today at six in the morning,” Saeed concluded his tale. He also told me that he could no longer remember the last time he had had a good night’s sleep. “But we must not let our exhaustion get the better of us. We owe it to our families. I owe it to my son. We shall carry on, and nothing is going to stop us,” the long-haired young man added resolutely and firmly shook my hand. Saeed is one of several thousands of refugees who are being “stocked” at the Keleti railway station in Budapest by the Hungarian government. He found out that his best friend died while trying to cross from Turkey to Greece.